Image classification refers to the task of extracting information classes from a multiband raster image. The resulting raster from image classification can be used to create thematic maps. Depending on the interaction between the analyst and the computer during classification, there are two types of classification: supervised and unsupervised. With the ArcGIS Spatial Analyst extension, there is a full suite of tools in the Multivariate toolset to perform supervised and unsupervised classification (see An overview of the Multivariate toolset). The classification process is a multi-step workflow, therefore, the Image Classification toolbar has been developed to provided an integrated environment to perform classifications with the tools. Not only does the toolbar help with the workflow for performing unsupervised and supervised classification, it also contains additional functionality for analyzing input data, creating training samples and signature files, and determining the quality of the training samples and signature files. The recommended way to perform classification and multivariate analysis is through the Image Classification toolbar. Supervised classification uses the spectral signatures obtained from training samples to classify an image. With the assistance of the Image Classification toolbar, you can easily create training samples to represent the classes you want to extract. You can also easily create a signature file from the training samples, which is then used by the multivariate classification tools to classify the image. Unsupervised classification finds spectral classes (or clusters) in a multiband image without the analyst’s intervention. The Image Classification toolbar aids in unsupervised classification by providing access to the tools to create the clusters, capability to analyze the quality of the clusters, and access to classification tools. 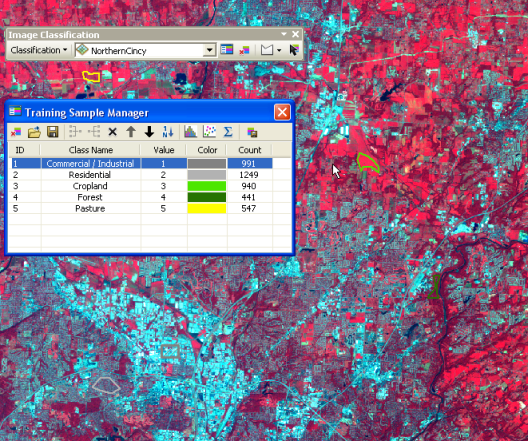 In the following example, the Image Classification toolbar was used to classify a Landsat TM satellite image. 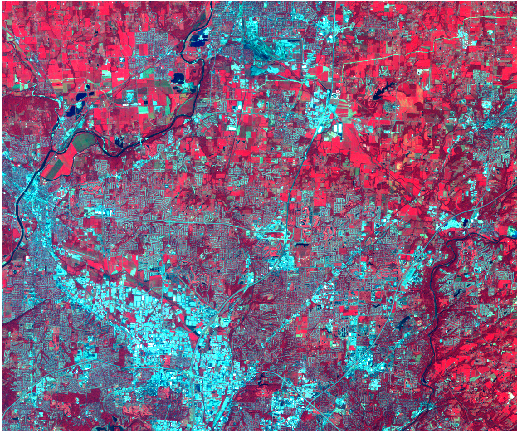 The following raw satellite image is a four-band Landsat TM image of the northern area of Cincinnati, Ohio. 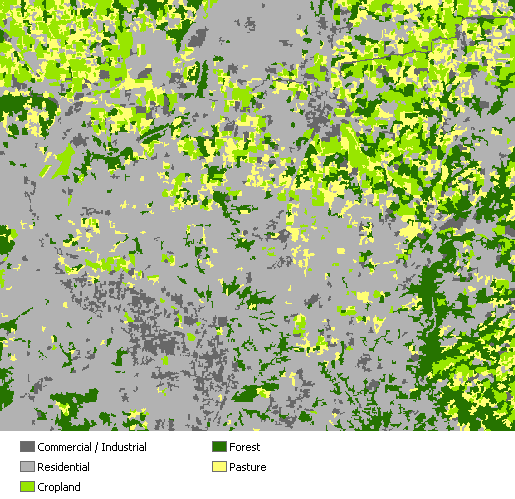 Using the toolbar, five land-use classes were defined from the satellite image: Commercial/Industrial, Residential, Cropland, Forest, and Pasture. The quality of the training samples was analyzed using the training sample evaluation tools in Training Sample Manager. 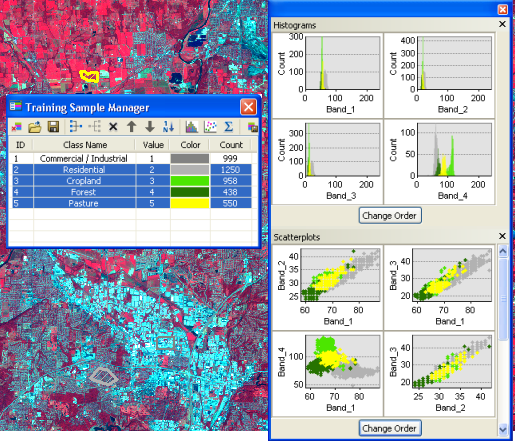 Using the Image Classification toolbar and Training Sample Manager, it was determined the training samples were representative for the area and statistically separate. Therefore, a maximum likelihood classification was performed from the toolbar. The classified image was then cleaned to create the final land-use map as shown below.